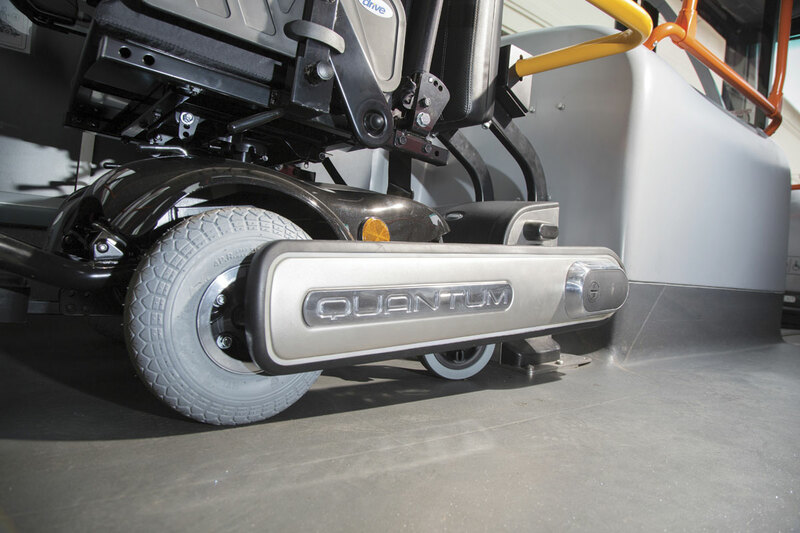 Q’Straint’s Quantum wheelchair securement system was released to much applause in 2013, winning a European Coach and Bus Week Innovation Label Award at that year’s Busworld exhibition in Kortrijk. It has been described as the world’s first fully automatic rear facing wheelchair securement system. Chris Peat originally covered the launch of the product (see B&CB 1256, 20 December 2013) and now brings news of the next milestone in its development, as it is fitted for the first time in real life operation in the UK, with a beta trial of it being carried out by East Yorkshire Motor Services (EYMS). Bus and Coach Buyer was invited to the operator’s Anlaby Road depot in Hull to see it in action. EYMS kindly took the 14-plate Wrightbus Gemini double decker out of service for the day to facilitate the special press showcase Q’Straint made on the trial. As well as representatives from Q’Straint, joining the group during the visit was Helen Dolphin MBE, Director of Policy and Campaigns for the charity Disabled Motoring UK. A wheelchair occupant herself, she tried Quantum and gave her opinion of it. She also gave an insight into her experiences and thoughts on bus use from a wheelchair user’s perspective. You can find out what she said later on in the article, but first a look at what Quantum is. 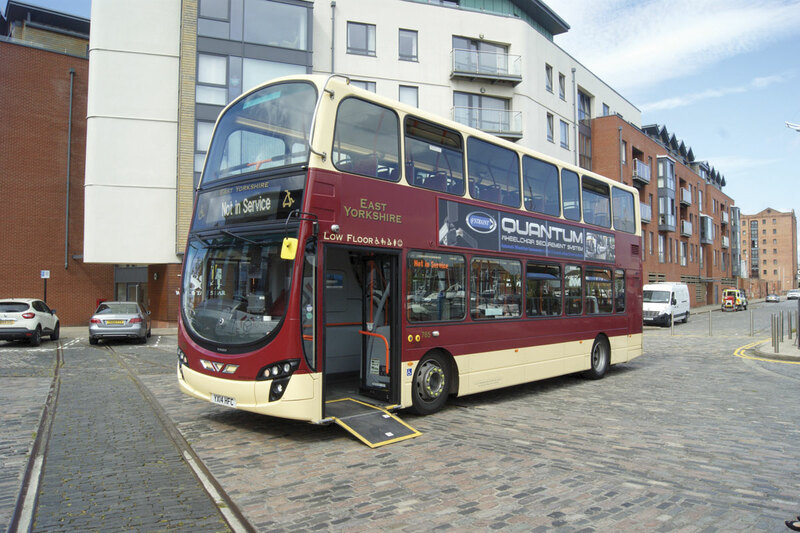 Quantum is designed to be fitted to virtually any bus as either OE or retrofit. 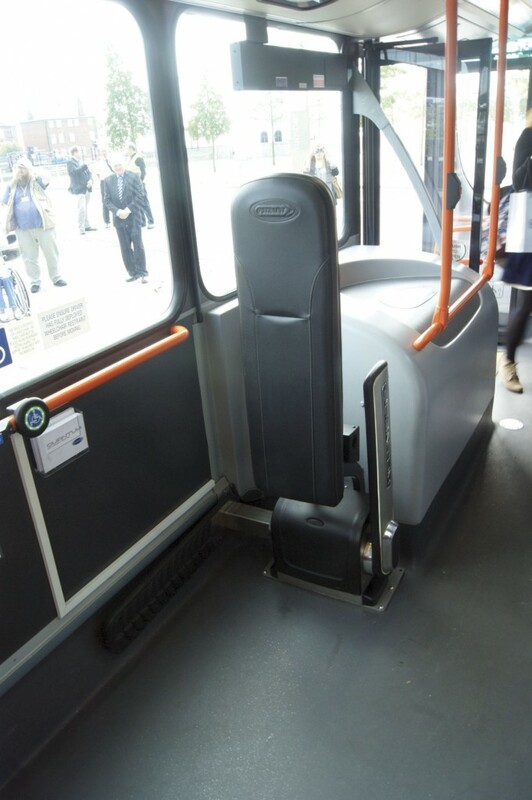 It enables wheelchair users to position their chair in the bay and secure it in a stable and safe rear facing position without driver assistance. Once the wheelchair has been positioned, the automatic locking sequence can then be activated by the press of a button. Two side arms come down, which grip the chair’s wheels. Bump N Go technology is used, which means that when the arms close in to secure the wheelchair, anything obstructing them will cause them to stop moving. This helps avoid injuring people and damaging property. When stopped in this way, a visual and audio alert is made with lights on the side of the arm flashing and a beeping sound. On the EYMS installation the driver has to press a button in the cab to allow the arm to continue moving into place. This feature was demonstrated on the EYMS bus. Once the arms are in place, a secure grasp is achieved by using a special compound in the rubber grip. To confirm the strength of this, Helen said she had encountered Quantum previously and tried to pull out of its grip whilst in a powerchair, but to no avail. Integration with the vehicle’s existing electrical and interlock systems should prevent accidental release while the bus is in motion. The button used to secure the chair is also the one used to release it when it is safe to do so. The EYMS bus was set up so the arms can only be released or secured in place if the handbrake is on. Helen thought this was a good safety feature. For additional security and to meet legislation for a grab rail between the aisle and window of the bus, an extra yellow curved anti-tip pole is available. This is slotted in place behind the Quantum system and bends round to the side of the wheelchair occupant. When not in use it is stored in the driver’s cab, with a special clip in place to hold it. An alternative to this could be for an upright anti-tip pole to be fitted, which many buses already have. The EYMS bus had one of these originally, but the operator preferred to have the curved horizontal pole instead, as it has several similar attachments for wheelchair positions for its fleet that its drivers are already familiar with. One of the benefits of Quantum that Q’Straint is keen to highlight is that it is not just for securing wheelchairs, but mobility scooters too. This form of personal transport is becoming increasingly common, so solutions for safely carrying them onboard may well be much sought after in years to come. Helen believes it could well be even more useful for mobility scooters than it is for wheelchairs. She said the way occupants must sit in these scooters and the way their weight is distributed in them would make restraining them in this way even more beneficial than it would be for a wheelchair. 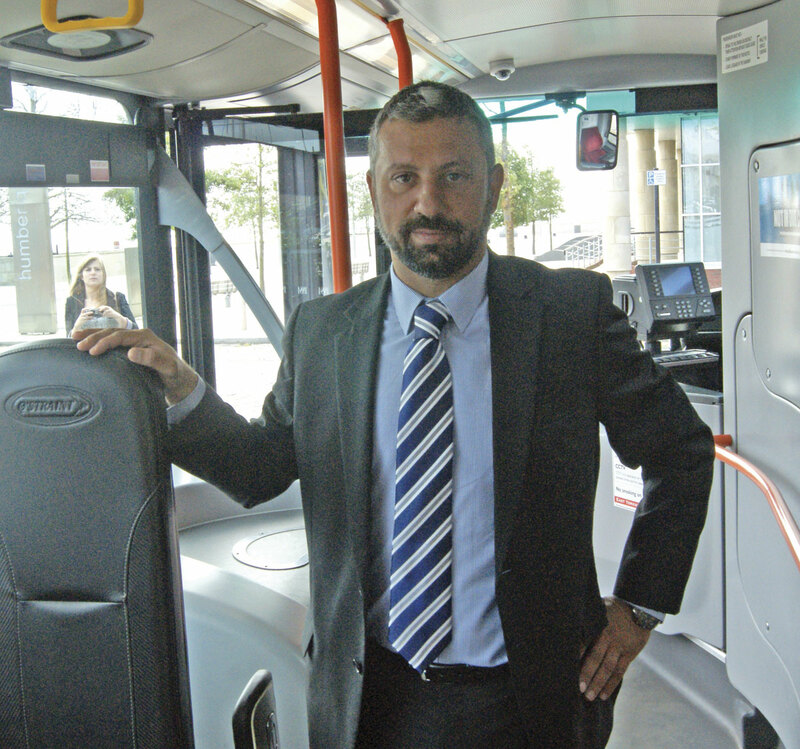 Quantum is designed for all buses, there are no separate models for different vehicles. Trains and ferries can also have them installed. Q’Straint originally gave an estimated time of 25 seconds for Quantum’s securement process, from the wheelchair entering the bay to being safely secured. However, one of the company’s Territory Sales Managers, Georgie Georgiades, who joined us for the event, said the company has got it down to being more like 20 seconds. During the demonstration on the day, it did certainly seem to work in that time frame. Helen found it easy to use, positioning her wheelchair easily. She liked the fact it only required one button press to activate and was pleased to see the provision of information on the side explaining what Quantum is and how it is used. The latter was seen as a good idea for those who had not used the wheelchair securement system before. Once she had her wheelchair secured, the bus set off on a trip around Hull to take in some of the sights. Our driver for the day was none other than Rob Hebden, famous for his appearance in On the Yorkshire Buses, the Channel 5 TV show. During the journey, Helen gave her thoughts on the wheelchair securement. She liked the fact it is reactive to any movements the chair might make. Quantum senses where the chair is and adjusts the grip accordingly. One concern raised during the event was what would happen to it in the worse case scenario of an accident. In the case of loss of power, the driver has an emergency release key that slots into an arm, allowing the arms to release the chair. Q’Straint has spoken to the emergency services about its products and they have advised the company that in the case of a crash it would be their priority to simply remove the wheelchair occupant from the vehicle. Helen informed us that 90% of wheelchair users can actually walk, if only a few steps at a time, so that if an incident did occur requiring them to get out the vehicle then they may well be able to do so without much if any assistance. She also said the 10% who cannot walk would more than likely have a personal assistant with them. Something that was highlighted was the idea that it is to be referred to as a ‘securement system’, not a restraint. The word ‘restraint’ has negative connotations, with wheelchair occupants not wanting to feel they are trapped in place. The fact Quantum is fully operated by the wheelchair user themselves is seen as a positive by Helen. After discussing Quantum, talk soon turned to buses and the mobility impaired. When it comes to disability access legislation for public transport in general, Helen said the UK seems to be somewhat behind the rest of the world. However, she said she does see operators around the country who are taking onboard the needs of the disabled and are not waiting on legislation to start implementing technology like Quantum. 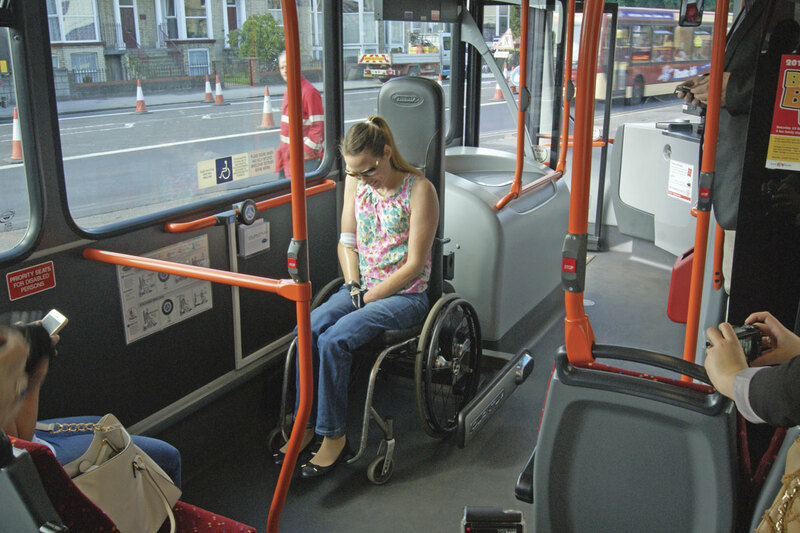 It is not so much the amount of accessible equipment being fitted onboard buses and coaches that is the problem, according to Helen, more so it is how it is being used. Getting on the bus is not the real issue now; she brought up the topic of the contention between pushchairs and wheelchairs and who is entitled to the dedicated space. This was an issue discussed several times during the event. Commenting on what else disabled people would like to see more of to make buses more accessible, she mentioned audio visual technology. ‘One thing stopping me from using buses more is that if I’m in a town I don’t know, I’m not necessarily going to know what stop is mine,’ she said. To initiate this first installation, Q’Straint approached EYMS for a trial. Georgie said, ‘We picked them for their enthusiasm for new technology that benefits their passengers and operation.’ He went on to say that EYMS Chairman, Peter Shipp, is passionate about improving his services, not only for commercial reasons. On my visit it had been in place on the EYMS bus since April and in that time Georgie claimed it had been used 200 to 300 times without any technical hiccups. This, he believes, demonstrates its reliability. EYMS is not the only place it is being trialled. It is also being used by an operator based in a seaside town in north west England, where Georgie said they get a high volume of mobility scooters use their services. 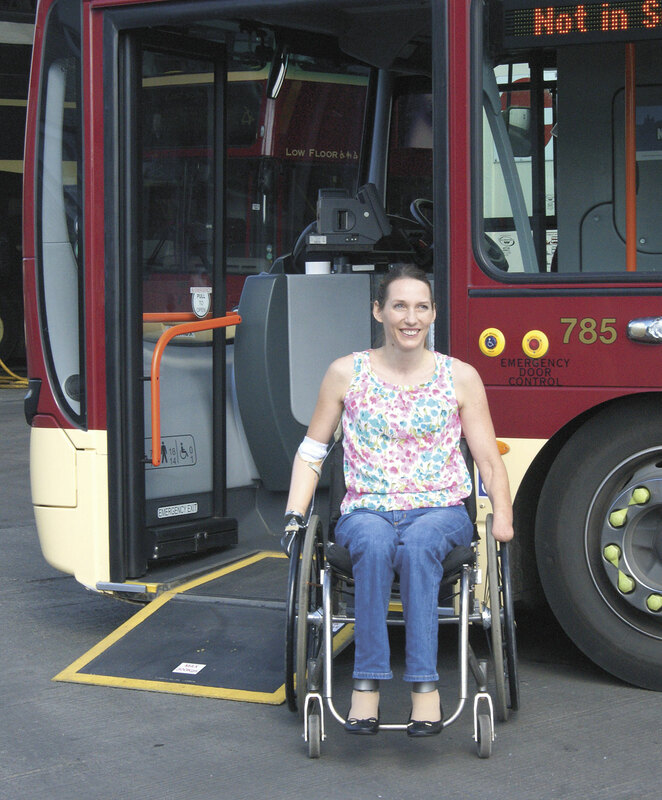 Another significant trial is planned for Lothian Buses, where the system is expected to have a lot of wheelchair occupants use it. Since it has been trialled at EYMS, Georgie said Q’Straint has learnt ‘ultimately what ticks the boxes for operators’. 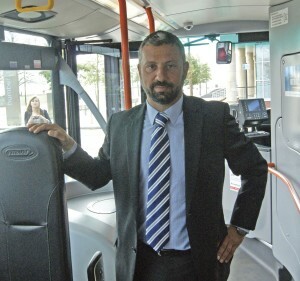 He has found out what needs doing to roll out a comprehensive training regime for drivers in the use of Quantum and given them an even better insight into what bus passengers who use wheelchairs want. He said these passengers are finding they had not realised they needed such a system until the release of this product. The development of Quantum in Europe is not constrained to operators, with Q’Straint in talks with three UK bus manufacturers for it to be installed as OE. With Quantum being successfully used in the US, it will be interesting to see how well it does in Europe. The fact it is now being trialled by others besides EYMS and that manufacturers have become interested in it show its appeal is certainly growing. Helen Dolphin certainly found it appealing and would no doubt be pleased to see it rolled out on buses across the country.